John Deere’s updated 2R Series small chassis compact tractors replace the previous 2020 Series and, along with their new model numbering, now feature a reverse implement option (RIO). Adopted from the John Deere lawn tractor range, this new function is an extra standard safety feature that allows the operator to mow when reversing if necessary, but only by depressing the RIO button before shifting into reverse gear. The four-wheel drive 2025R, 2027R and 2032R replace the 2320, 2520 and 2720 and are powered by Yanmar three-cylinder diesel engines developing 24, 27 and 31hp respectively. These Stage 3a engines generate lower emissions while providing more power, increased torque and lower fuel consumption. The two-range, two-pedal hydrostatic transmission has a maximum forward speed of 14mph (22kph). The tractors are also equipped with hydrostatic power steering, plus cruise control on the two larger models. A two-post folding ROPS is supplied as standard, while the optional deluxe cab has a low noise rating of 85dB(A) at the driver’s ear. Mid-mounted rotary mower deck options include a 1.5m (60in) rear discharge unit and two ‘drive-over’ side discharge decks at 1.37 and 1.57m (54 and 62in), which are equally easy and straightforward to hitch up and use. These AutoConnect decks allow the operator to simply lock the deck in place and attach the driveline automatically from the tractor seat, without the need to crawl under the tractor to connect the pto. 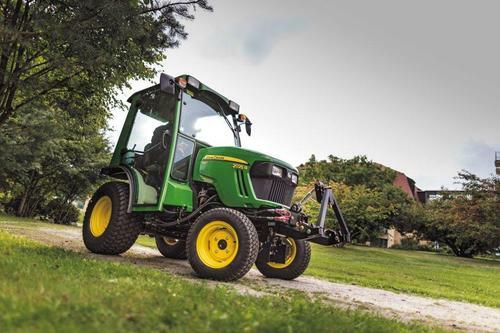 For extra versatility, a front hitch and pto are available in addition to the standard mid-mounted pto, and are compatible with John Deere’s new H130 front loader, which replaces the 200CX model. The loader design allows fast attachment of 4-in-1 buckets, pallet forks, blades and a range of other implements.